A few days before the April 17-19 OAS Summit of the Americas in Trinidad, which now seems light years in the past, a group of leaders met in Venezuela under the umbrella of ALBA, the Bolivarian Alternative for the Americas. ALBA, the brainchild of Venezuelan President Hugo Chavez, established to challenge US economic influence in the hemisphere, adds to the alphabet soup of acronyms for the sundry organizations into which Caribbean countries are increasingly drawn. The latest is St Vincent and the Grenadines, whose Prime Minister, Dr Ralph Gonsalves, has taken his country of micro islands into the the four and a half year old ALBA that originated from a Cuba-Venezuela Agreement signed by Chavez and Dr Fidel Castro based on Chavez’s vision for as an alternative to the US-sponsored Free Trade Area of the Americas (FTAA). St Vincent joins fellow OECS (Organization of Eastern Caribbean States) and CARICOM (Caribbean Community) member Dominica in ALBA and immediately left the question begging: whither CARICOM, the OECS and all the other integration and cooperation organs when their members saunter into the arms of latest suitor that passes by with a flute playing a tune of “economic aid”. But this piece is not about whether CARICOM and it’s partner the Association of Caribbean States (ACS) will withstand the vicissitudes of competing forces such as Trinidad’s loss of influence to Venezuela, even with its own be it smaller reserves of oil to offer support to it’s former federal partners. It is not even about how Trinidad, which hosts the headquarters of the ACS and welcomed the hemisphere under the auspices of the OAS, views the ALBA agenda. Nor is it about the fact that Gonsalves and the Prime Minister of Trinidad and Tobago, Patrick Manning have been leading a public discourse on the political integration of their countries and attempting to get other CARICOM states to join them. This is simply about the fact of the mishmash of organizations with the same goals and each drawing dues or other contributions from some members who can hardly feed their local populations. So, here’s a quick list of a few of the organs and what they say they offer. 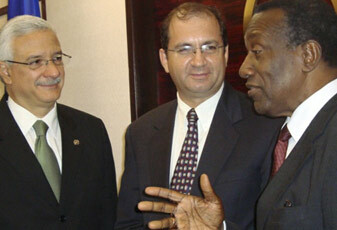 CARICOM with its headquarters in Georgetown, Guyana, is a successor of the Caribbean Free Trade Association (CARIFTA) which was itself an attempt by the former members of the Federation of the West Indies to continue the agenda of cooperation in trade without the baggage of the failed political integration. It was established in July 1973 under what became know as the Treaty of Chaguaramas, for the location in Trinidad in which it was signed, with the aims of the free movement of labour and capital, and the coordination of agricultural, industrial and foreign policies. That treaty was revised in 2001. It has 15 members drawn from the original group of Antigua and Barbuda, The Bahamas, Barbados, Belize, Dominica, Grenada, Guyana, Jamaica, Montserrat, St Kitts and Nevis, St Lucia, St Vincent and the Grenadines and Trinidad and Tobago and more recently, Haiti and Suriname. The OECS, with its headquarters in Castries, the St Lucian capital came into being in June 1981, when seven Eastern Caribbean countries signed a treaty agreeing to cooperate with each other and promote unity and solidarity among the Members. The Treaty became known as the Treaty of Basseterre, in honour of the capital city of St. Kitts and Nevis where it was signed. “Our mission is to be a major regional institution contributing to the sustainable development of the OECS Member States by assisting them to maximise the benefits from their collective space, by facilitating their intelligent integration with the global economy; by contributing to policy and program formulation and execution in respect of regional and international issues, and by facilitation of bilateral and multilateral co-operation,” says the OECS on its Web site. The OECS which also entails a currency union, comprises Dominica, Grenada, Montserrat, St Kitts and Nevis, St Lucia, St Vincent and the Grenadines with Anguilla as an associate. The Convention Establishing the ACS was signed in July 1994 in Cartagena de Indias, Colombia, with the aim of promoting consultation, cooperation and concerted action among all the countries of the Caribbean, comprising 25 member states and three associate members. Eight other non-independent Caribbean countries are eligible for associate membership. The members are Antigua and Barbuda, Bahamas, Barbados, Belize, Colombia, Costa Rica, Cuba, Dominica, Dominican Republic, El Salvador, Grenada, Guatemala, Guyana, Haiti, Honduras, Jamaica, Mexico, Nicaragua, Panama, St Kitts and Nevis, St Lucia, St Vincent and the Grenadines, Suriname, Trinidad and Tobago and Venezuela. The OAS, says its Web site, “brings together the nations of the Western Hemisphere to strengthen cooperation on democratic values, defend common interests and debate the major issues facing the region and the world. The OAS is the region’s principal multilateral forum for strengthening democracy, promoting human rights, and confronting shared problems such as poverty, terrorism, illegal drugs and corruption. It plays a leading role in carrying out mandates established by the hemisphere’s leaders through the Summits of the Americas. The members are Antigua and Barbuda, Argentina, The Bahamas, Barbados, Belize, Bolivia, Brazil, Canada, Chile, Colombia, Costa Rica, Cuba (suspended), Dominica, Dominican Republic, Ecuador, El Salvador, Grenada, Guatemala, Guyana, Haiti, Honduras, Jamaica, Mexico, Nicaragua, Panama, Paraguay, Peru, Saint Kitts and Nevis, Saint Lucia, Saint Vincent and the Grenadines, Suriname, Trinidad and Tobago, United States of America, Uruguay and Venezuela. ALBA, the Bolivarian Alternative for the People of Our America (Spanish: Alternativa Bolivariana para los Pueblos de Nuestra América or ALBA – which also means ‘dawn’ in Spanish) is an international cooperation organization based upon the idea of social, political, and economic integration between the countries of Latin America and the Caribbean. The 7th ALBA summit in April approved the introduction of the SUCRE (Sistema Único de Compensación Regional; English: Unique System for Regional Compensation) as a proposed regional currency for ALBA and Ecuador. It is intended to be in use as a virtual currency by early 2010, and eventually as a hard currency. ALBA so far comprises Bolivia, Cuba, Dominica, Honduras, Nicaragua, St Vincent and the Grenadines and Venezuela. Grenada has stated it is not ready to join the bloc. With the global financial disarray strangling the economies of developing countries like those of the Caribbean, making it difficult for politicians to frame balanced, far less sustainable budgets, it will be interesting to see just who will be lining up with their bowls at the alphabet soup kitchens of “economic aid”. The secretaries general of the ACS, SIC and CARICOM.